Located in the south of Zhangjiajie National Forest Park, part of Wulingyuan Scenic Area, Yellowstone Village is surrounded by peaks and cliffs. It is the best viewpoint for the sunrise and the best and largest viewpoint for enjoying the sandstone peaks in the park. With an elevation of 1,080 meters, the mountain - Yellowstone Village offers a flat and open view point on the top with many trees. On the path, visitors can meet wild monkeys. Yellowstone Village offers many attractions to visitors to explore, such as Star Picking Platform at the east end of the village, Palm Peak, Six Wonders Pavilion on the top, natural murals, Conch Peak, Head of Dragon Peak, South Heaven Gate, West Heaven Gate, Couple Rock and so on. Visitors can admire the breathtaking views on the top of the mountain which is always in the clouds. 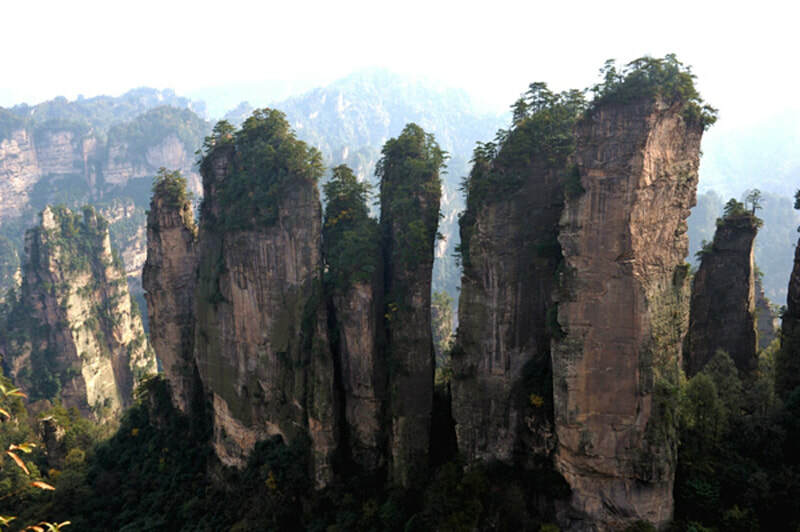 There are 5 pine trees surrounding a 3-meters-long, 1.5-meters-wide and 0.8-meters-deep stone on the mountain. It is the works by the nature. Visitors need to walk around one thousand stone steps from the foot to the top. There are cable car available for those who don’t enjoy climbing or whose conditions are unfit for climbing. Visitors will be shocked and amazed at the natural beauty in the area. The best time to visit Yellowstone Village is from April to October as it is not too hot or too cold during this period of time. April and October is the two best months to visit Tianmen Mountain. There are five ticket stations in Wulingyuan Scenic Area. The Zhangjiajie National Forest Ticket Station is the closet one to Yellowstone Village. There are the tourists bus from Zhangjiajie Bus Station to National Forest Ticket Station. Therefore, there are several options. Rent a car from Zhangjiajie airport, Zhangjiajie Train Station or Zhangjiajie Bus Station to the National Forest Ticket Station. Then, take a cable car to the top of the mountain. This is the quickest and most direct option. Take a flight to Zhangjiajie airport from Guilin, Beijing, Chengdu, Wuhan, Xi’an and other cities. Then, rent a car to Zhangjiejie Train Station to take the shuttle bus. It takes 40 minutes drive from the station to National Park Ticket Station. Alternatively, rent a car to the ticket station. At the ticket station, visitors can hike to or take a cable car to Yellowstone Village. As Yellowstone Village is located in Zhangjiajie National Forest Park which is part of Wulingyuan Scenic Area, visitors can enter the the park from National Park Ticket Station with the pass ticket for Wulingyuan Scenic Area. The pass ticket is valid in four days from the date when you get it ( For example, if the ticket is issued at 13:00 on Monday 9th July, 2018, the ticket is valid by 13:00 on Friday 13th July, 2018). You could take a complimentary eco-friendly car with the pass ticket. With the pass ticket, you can visit all the four scenic areas mentioned above and can enter the Wulingyuan from one of five entrances at the five ticket stations. As at 9th July 2018, admission fee which is applied between December 1st and February 28th/29th is as follows. Admission fee to Wulingyuan Area is 126 CNY per adult (including the insurance). Notes: The area can be closed because of the snow in winter. Please remember not to take any food in your hand in case that you are hurt by the wild monkeys on the path. If they are interested in your food, they will catch it from your hand. During the National Day Festival of China, Spring Festival and the summer holiday, pricing for hotels and restaurants also goes up. You could bargain for what you want to buy in Zhangjiajie if you can speak Chinese well. Interested in visiting the Yellowstone Village on a Tour? Wendy Wei Tours offers a variety of different packaged tours as well as custom tours including the Yellowstone Village, among other attractions and destinations. To find out more, please visit our Tours page or Contact Us directly to find out more.